Your passwords along with records are safe with us and will be used for import solely. It takes you no longer than 15 minutes to set up the import to UserVoice and start the test data transfer. We do not share any of your personal information with third parties, and additionally meticulously protect it, so not a thing gets lost or stolen. Our service was developed to provide you with a user-friendly data migration tool that helps to get the work done seamlessly. Only Help Desk Migration lets you automatically transition custom fields, as well as map their destination. All tickets will be imported to UserVoice with their corresponding agents, contacts, and attachments, as a result, saving the record of customers' requests. In the new help desk, create profiles for your agents and custom ticket fields. When done, go to Migration Wizard and start the UserVoice import. Select your current help desk from the catalogue and fill in the form to enable our migration tool fetch the records. 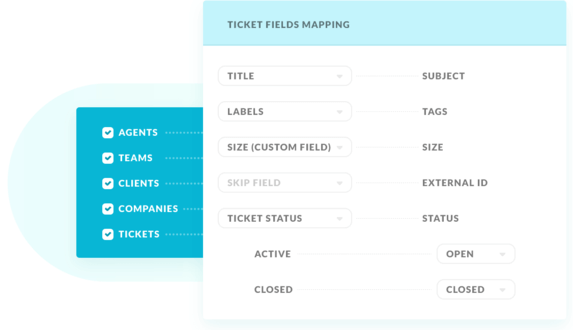 Select the records that you need to migrate and set the mapping of ticket fields, both standard, and custom. Once everything's checked, choose a good time when most of your customers are offline and initiate the Full Data Migration. We consider safety very seriously and have established a complete set of practices , technologies , and policies to help guarantee your data is protected.